The main targets of the injection testing are to ensure that the protection system is safe, meeting the specifications, requirements, settings, and the expected reliability. The injection testing verifies the electrical equipment in terms of tripping times, operational behavior, resistance, opening, closing and insulation capacity, etc. This involves a range of testing methods which for easier choice we can divide in two main groups, primary injection testing and secondary injection testing, which in turn can include current and/or voltage injection testing. Specialized high quality testing equipment is required to ensure an accurate and efficient electrical injection testing. For over 30 years, the injection testing equipment of SMC are the preferred choice of professionals for testing and measuring in the power field, and are well known for high reliability at competitive prices. High current injection testing is widely used for testing the complete loop of the protection scheme, and general primary testing of main assets like transformers, breakers, motors, switchgear, etc, and overcurrent protection testing from primary side. 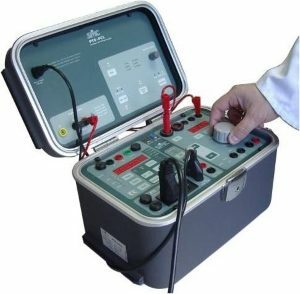 Our traditional variac-based LET range of primary injection testing sets are perfectly adequate to all primary applications, with various models from 1 KVA to 8 KVA, with simple, robust construction, compact size, and ease of use, with injection testing capacity over 20,000 A depending of the selected model. 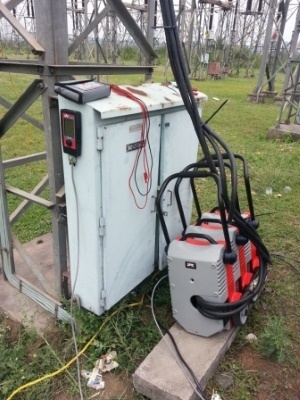 The Raptor of SMC is a multifunctional substation injection testing system, the smallest and lightest on the market, with modern high-tech design that enables the highest level of injection testing capability in terms of power and duty cycle, making the primary injection testing easier, faster and more convenient. The system consists of a Master unit which can be upgraded with up to three Slave sets which add further power to the system. A small handheld control allows the user to monitor and control all the test process, including test results and test configuration tools. In comparison with the big and heavy traditional equipment, the RAPTOR is designed incredibly smaller and lighter than its predecessors, combining a revolutionary injection testing technology, with an automatic smart control, in a really transportable test unit of only 35 Kg, which is able to inject up to 15,000 A. The RAPTOR HV, the high voltage slave, is an optional product that extends the Raptor’s applications to tests that require voltage injection testing up to 2000 V. the Raptor HV takes advantage of all the valuable features in Raptor including the electronically controlled switching amplifier, DSP intelligence and a robust synchronization system. The Raptor includes test templates for the main primary injection testing applications such as testing of relays, circuit breakers and switchgear, current, voltage and power transformers testing, reclosers and sectionalizers, ground grid, polarity, step and touch, resistance, etc. The PRIME is a new generation of micro-ohmmeters for accurate low resistance injection testing, the only one in the market that includes both static and dynamic resistance measurement; the injection testing range of the PRIME reach up to 600 A of pure DC, with smart wireless remote control, predefined test modes and automatic reports. The dynamic resistant measurement is required in the condition evaluation of contacts in SF6 and vacuum type circuit breakers. The ETP System is a predictive maintenance system for power transformers, which includes 3-phase injection testing equipment for turn ratio, winding resistance, recovery voltage, polarization index and short-circuit impedance, along with diagnostics and trending software. The secondary injection testing covers not only the testing of protective relays and their tripping settings, but also the checking of all associated circuits and devices involved in the proper performance of the secondary protection system. SMC offers the widest range of secondary injection testing solutions, single and 3-phase, along with a full range of accessories and must-have tools for every need (PME-20-PH, PTE-30-CH, etc). PTE-100-C Series: a world leader reference in single-phase secondary injection testing. The PTE-100-C is the smallest and lightest of the market with outstanding 1000 VA power for up to 250 A, with measurement and current and/or voltage injection testing applications for quick testing at competitive price. A must-have instrument for the wide diversity of secondary injection testing works in any plant or substation. 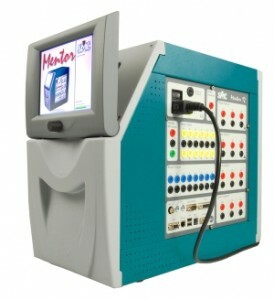 PTE range: a wide series of digital secondary injection testing equipment, single and 3-phase, with the required high accuracy and stability, reversibility in all output channels (current/voltage), dynamic injection testing, and interconnection capability; portable units, with high power capability, and straightforward use. MENTOR 12: the universal secondary injection testing solution, PC independent, with easy and intuitive touch-screen, modular concept up to 12 channels, advanced built-in test tools, independent amplifiers and lower maintenance. The MENTOR is perfectly suited for secondary injection test and relay testing, with a big sized screen that allows continuous graphic and visual monitoring of the test process, and the quickest and most complete manual control. The MENTOR integrates many useful test functions for secondary injection test, without the need of external PC, such as State Sequencer, Fault, Ramping, Pulse Ramps, Binary Search, COMTRADE playback, and on screen direct regulation of complex magnitudes (impedance, power, symmetrical components, homopolar voltage, etc). The optional software ROOTS automates the relay injection testing with accurate fault calculation, sequential testing, and automatic reporting with several protection-oriented modules and test templates. As usual with SMC test equipment, simplicity and ease-of-use are common to all the solutions. For more information, please check the related SMC products or contact us.